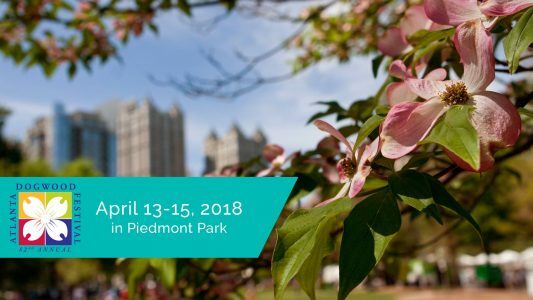 The Atlanta Dogwood Festival will take place at Piedmont Park from April 13-15, 2018. There’ll be free live entertainment on two stages all weekend long, plus an artists market, disc dog exhibition, Kids Village,& more. Got little ones? Head out for Family Friday. From 2:00 p.m.-9:00 p.m. on April 13, there’ll be family-oriented entertainment, inflatables, & more. Plus $12 buys an unlimited rides wristband good for rides & inflatables (wristbands will be available for $15 each on site). The wristbands are valid for Friday only. Bonus: You can show your unlimited rides wristband to score discounts at select food & beverage vendors, too. Piedmont Park runs along 10th Street & Piedmont Avenue in Atlanta. Be sure to check out the parking, shuttle and MARTA information before you go.